Life in and around the Victoria & Albert Waterfront is busy. Traditional musicians serenade visitors with tribal music on the plain, as they take in the inimitable vibe of the V&A Waterfront, and have their pictures snapped at the yellow frame with Table Mountain in the background. 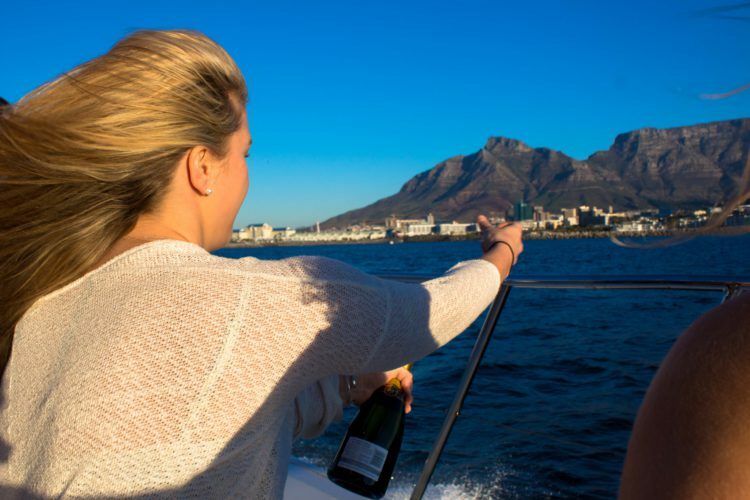 But, despite all the attractions available at the Waterfront, and anywhere else in the city, there is only one way to truly experience the best that Cape Town has to offer – and that is aboard a Waterfront boat cruise. Our sunset boat cruises take you all the way to Clifton 4th Beach, and even as far as Table Bay, depending on the weather on the day. Once we reach the destination, you will enjoy a glass of complimentary wine, as we watch the sun set over Table Mountain and the city. After this, we make our way slowly back as Table Mountain and the 12 Apostles are draped in splendid colours, creating an exquisite backdrop. It’s a 90-minute cruise that is definitely the right choice for the romantic at heart. Our lunch and dinner boat cruises are popular for a reason. If you’re looking for a unique venue to host your special occasion, business luncheon, product launch or birthday party, look no further than our floating restaurant. Join us for a deliciously prepared lunch or dinner on the Tigger 2 Royale catamaran, and treat your party to the experience of a lifetime with our Waterfront lunch and dinner boat cruises. We offer you a wide choice of duration and menu options guaranteed to appeal to all tastes and preferences. The lunch boat cruise, in particular, allows you to enjoy a picturesque bay cruise that sails from the Waterfront. Here, you get to take in the beautiful views of Lion’s Head, Signal Hill and Table Mountain, as you enjoy your lovingly prepared lunch. We either drop anchor at Granger Bay, or in front of Clifton 4th Beach. For the dinner cruise, we depart from the Waterfront, enjoying a charming bay cruise with beautiful views of Table Mountain in the background. After admiring the spectacular Cape Town sunset, we return to the mooring and drop anchor, as we get ready to serve the delicious dinner you’ve been waiting for. Contact us to book your Waterfront boat cruises way in advance, in order to avoid disappointment, and look forward to experiencing the real Cape Town.